I am Trevor MacDonald and I live in Winnipeg, Manitoba. I hold an honours BA in Political Science from the University of British Columbia, and am enjoying being a stay-at-home dad. I blog regularly at The Huffington Post, and have also written for Out Magazine and This Magazine. I have done numerous interviews for newspapers, radio, and television as an LGBT activist. 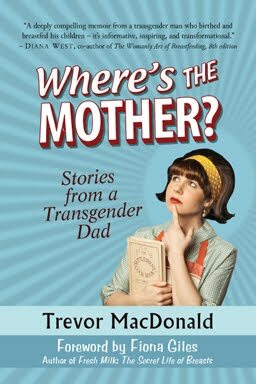 My book, "Where's the Mother? Stories from a Transgender Dad" is now available as a hardcover, paperback, and ebook at your favourite retailer. Stumbled across your blog and just wanted to say that as a La Leche League leader, I am amazed and inspired by your story of nursing Jacob! Best wishes to you all. Wow! Just read your stor online. Posting my support. I read about your situation last night, and it is unfortunate that LLL is not quite ready to accept all breastfeeding parents. While I am hoping to become a LLL myself I feel that regardless of your gender identification, you are the parent in the breastfeeding relationship and you bring a unique point of view to parents. You have my full suport and I would love to offer my assistance in your new suport group once I finish my Lactation Educator training at the end of the year. Feel free to reach out to me if you like. I'm curious. As a transgender, do you not take hormones? If so, what about the effects of those hormones on your son? Hey Trevor! Gotta tell you - I'm impressed. I'm an advocate for human rights and I am grateful when people are willing to express themselves fully and do what is right in their heart vs. what everyone else expects. I've received a tremendous amount of criticism for nursing my baby still who is turning 3 Sept 5th. But I have done it for her anyway. She mostly nurses now for comfort. Hm is that a seriously such a terrible thing? Many people apparently think so. Anyway. Major Kudos to you from a fellow nursing mom! I'm so happy you are standing up for what is right for you and your family. I just read about you on Yahoo! I think that the LLL is totaly missing a part of the community that you could be helping. There are fathers both gay and straight that have used the same device that you did to allow them to breastfeed. To me it sounds like the LLL has a very narrow very of how things should be. They need to step back and take a look at who they could be supporting with someone like you as one of thier leaders. Maybe you can start a group like LLL that isn't so narrow sighted and more willing to take the help from where it comes from. I don't see what makes your experience any less valid then anyone elses. Please keep at it and thank you for sharing your story with the world. If more people shared thier stories, breast feeding would be in the spot light more offten. I just this minute finished hearing your interview on CBC radio. Congratulations on the birth of your son and your success with breast feeding! My 5-year-old daughter and I were listening and heard about the story of a father who breast feeds his baby. My daughter asked how this was possible, and after hearing your story I told her you were born a girl but decided to become a man, so you were still able to breast feed. She thought that was great, and I do too! I will be sending a letter to LLL in support of you wanting to become a leader. I see no reason you would not be able to mentor breast feeding mothers (or possibly breast feeding transgender fathers). To deny you this role due to what I see as simple semantics is absurd. I am an avid follower of Ina May Gaskin, and she says men (non-transgender) are sometimes able to breast feed their babies. You meet the basic criteria for becoming a leader (you have breastfed your child, you are a loving parent, and you want to assist other parents find success in breast feeding) hence you should be allowed to do so! Hi Trevor! I recently sent you an email from stephanie@offbeatempire.com asking if we could share your story on our site. If you're ok with that just let me know! I'd really like to subscribe to your blog by email, but I don't see that as an option (just Google). Is this possible? I just wanted to say thanks for writing this blog. I am married to a M2F woman, and trying to figure out how we can handle breast feeding is...not something there's a lot of information out there on. Thank you, thank you, for writing this and putting it on the web. I need to ask some questions in private about inducing lactation in women with a transsexual history of which I am one. How can I reach you? The questions are very specific to the interview with Sarah. I sent you an email from my private address but you can also always contact me at my blogger address, milkjunkies (at) ymail (dot) com. I check both addresses regularly. I hope I can help. I am curious if you had keyhole surgery? I had the double incision and assumed it would be impossible to breastfeed. Bonjour, votre histoire montre que votre pays, Le Canada, est très en avance sur le reste du monde, dit "civilisé". Si les habitants de La France pouvaient en "prendre de la graine", ils seraient fort bien inspirés. Je ne jalouse pas l'intelligence de l'Autre, mais, en l'espèce, vous nous administrez une réconfortante leçon de générosité. Désormais, je serai un de vos fidèle lecteur. Signé: Gabriel, à La Réunion. I have been following your story in bits and pieces since my cousin in the La Leche group you first visited mentioned you to me. I was delighted to spot you in the park this summer breastfeeding your younger child. My 5 year old and her friend were visibly curious about what you were doing. I didn't know they were old enough to spot the anomaly. Thank you for widening their horizons! Hey trevor need so me advice from you. I'm a trans man who want to have babies too but in spain you could not talk these freely with a doctor so hope you can solve me doubts. Hello Trevor, I heard your interview on CBC radio and was lucky enough to win your book! Finally I had the time a couple of months later to read it, and was fascinated, educated and reminded of my own birthing and breastfeeding obstacles and triumphs. My former partner and fellow parent transitioned (MTF) a couple of years after our married relationship ended, and it was a very difficult few years for my children in particular without any personal role models in our community. That said, they have grown into very sensitive, loving young adults who embrace diversity and who are very close to both of their mothers. I am so impressed by your courage and determination to create a rich and true life for you and your family. Thank you for sharing your story. Hi Laura! Very neat to hear from you. I always wondered who got that copy, and if they enjoyed the book :) I'm so glad to hear that you and your children's other parent both have strong relationships with your kids and that things worked out ok despite some difficult times. Sounds like you are a terrific parent!